Tuesday night marked one of long­time Dayton Mayor Ken Rankle’s last city council meetings as the city’s executive, and he took the opportunity to express both gratitude to some and frustration with others in what was the first time council met since his decisive loss to councilman and Mayor­-elect Virgil Boruske on Election Day. Rankle began the meeting by offering his congratulations to all those who won a seat on Election Day, saying, “I hope everything moves forward and we have a very cooperative council." 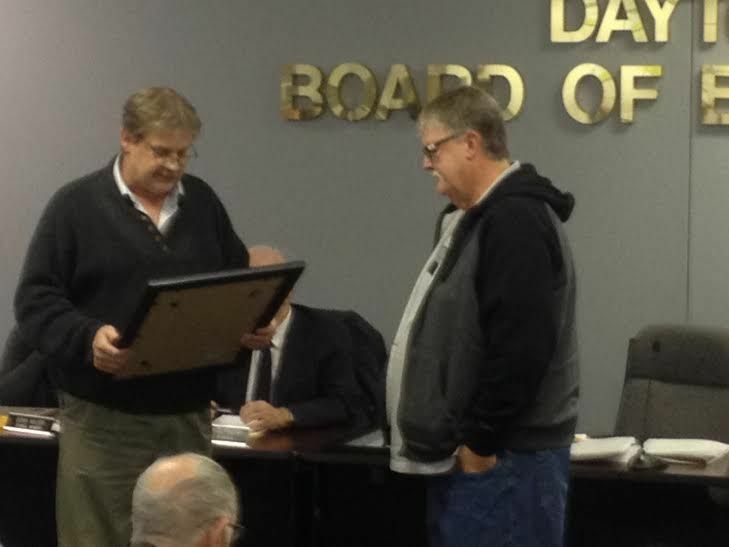 Rankle then took the opportunity to name Dayton Park Board member Tom Schwartz as Dayton’s Volunteer of the Year, which included a mayoral proclamation and presentation to Schwartz, whose involvement in Dayton’s parks and recreation initiatives for years Rankle applauded, with a key to the city. Rankle also recognized councilwoman Cathy Volter for her 18 years of service on city council, and her years of service that preceded and is to come, he said. 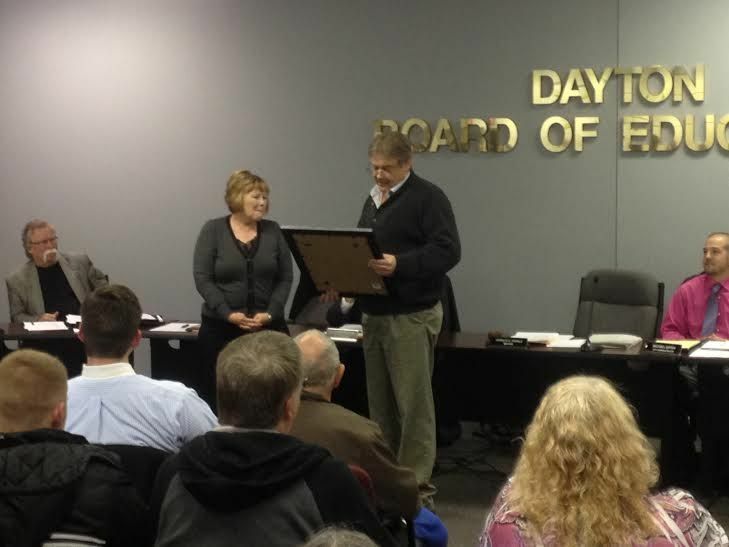 “She’s not been exceeded in her efforts to serve the people of Dayton,” Rankle said, as he handed Volter also a key to the city. Volter is the longest­-serving woman to sit on Dayton city council, Rankle said. But not long after Rankle concluded his accolades, his voice turned down, shaky, a bit more reserved. Rankle, like the rest of Dayton City Council, has been no stranger to controversy over the past year. Most notably, he found himself in some hot water regarding comments directed at the Bellevue/Dayton Fire Department. During Monday night’s lame­duck session, though, Rankle claimed he was slandered during his campaign for re­election. In particular, Rankle made mention of an email from a Dayton resident that, Rankle alleged, accuses the mayor of using city funds and resources to finance campaign activities. “These are nothing but lies,” Rankle said. The resident, who was in the audience, fired back that they were not accusations but inquiries into an event Rankle’s campaign hosted, which was rumored to have used city resources. “There are so many stories out there,” she said to the mayor. Rankle replied by asking City Clerk Donna Leger and Police Chief Scott O’Brien if any city or police resources were used for the event, and both said that there had not been. “I don’t have to sit here anymore and take lies like this,” Rankle said, as many in the audience applauded and even stood, offering an ovation for the ousted mayor. When it came time for residents to address council, Jennifer Sierra, who also ran unsuccessfully for a seat on Dayton’s city council, stood up to decry what she called drama and bullying that occurred during the campaign, of both candidates and residents. Specifically, Sierra pointed to Facebook as a hotbed. Like many other cities, residents of Dayton have started several Facebook pages and groups in recent years, meant as message boards for sharing news and thoughts about the community. Sierra believes them to be causing more harm than good. Sierra, who publicly voiced her support for Mayor Rankle during her campaign, echoed the mayor’s initial hope for a cooperative council moving forward, pleaded with council and residents in the audience, some of whom were council members­elect not yet in office, to work to achieve some level of harmony. Dayton’s new city council takes office in January.